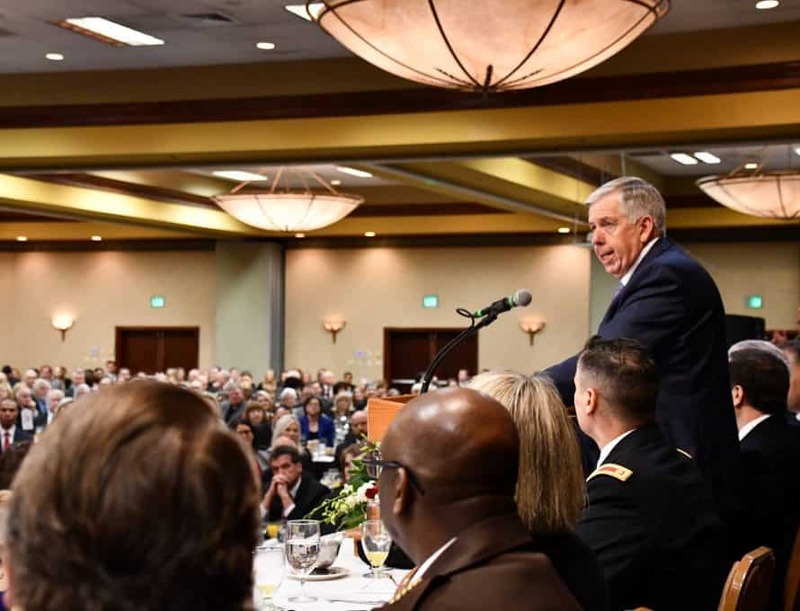 JEFFERSON CITY – Missouri Governor Mike Parson addresses a packed room during the Governor’s Prayer Breakfast here, Jan. 10. Photo courtesy of Missouri Governor's Office. Parson told his audience that, like the Good Samaritan, they should seek to serve other people, and most of all to serve God. “We should be driven by our faith every day,” he said, and we should put everybody in front of us. During the service, Pastor Billy Russell of FBC Bolivar prayed for the governor and others assembled in the room. “I was glad to be available and support Mike in prayer,” he later told the Bolivar Herald-Free Press. In his prayer, Russell thanked God for Gov. Parson and First Lady Teresa Parson and prayed that He protect and strengthen them. He prayed that Missouri’s public servants would have compassion to “meet present needs, to be the voice of the voiceless,” and he also thanked God and prayed for the families of these public servants.